A museum exhibit building was being built for the Fort Mose State Park in the spring and summer of 2006. Archaeological monitoring was carried out during land disturbance activities. The construction procedures consisted of foundation excavation, land clearing, pond creation and the preparation of utility and water drainage pipe line trenches. Earthmoving procedures were monitored to ensure that there would be a minimum of cultural resource.disturbance. Where it did occur, records were prepared and cultural materials collected. The investigations identified several cultural resources. There was a general distribution of historic artifacts in the northern and north central areas. These mainly consisted of domestic functional types that had manufacturing dates ranging from the central to the latter part of the nineteenth century. Most were food service and storage related along with medicinal containers. These may be refuse deposits made by St. Augustine in the latter decades of the nineteenth century. Also, an engraved limestone fragment with finished surfaces was recovered from a disturbed surface context in the southern part of the northeastern area. It may possibly be a cover section from a small sarcophagus. In that same general location, two isolated prehistoric artifacts were found in an undisturbed soil at a substantial depth below ground surface. One test unit had a chert secondary flake and another contained a shell midden with a body sherd of what may be San Marcos pottery that is associated with the historic contact period. Immediately east of the central project section, there is a linear earthen formation that crosses a wetland and may be associated with the late nineteenth century rail line that ran from St. Augustine to North Beach. The historic cultural material scatter along and near the northern entrance road and in the north central area has been classified as a site designated, 8SJ5238. The linear earthen formation crossing the wetland, possibly a railroad alignment, has been given the site number 8SJ5257. Recommendations have been suggested to provide protective measures for these cultural resources. In addition, a comprehensive archaeological study is needed in the future to identify all cultural resources in the park, assess their cultural significance and develop preservation plans. The monitoring activities were carried out by Ted M. Payne (F.A.C. and R.O.P.A.). R. J.
Payne (President) was report editor. Monitoring began on May 9 and continued for periods of time until July 26, 2006. Thereafter artifact analysis took place and a project report was prepared. --' .' ,Golf Club . In 2003, a Phase I Cultural Resource Survey was also conducted in the northern part of the project area by the City of St. Augustine Archaeologist, Carl D. Halbirt (Halbirt 2003). It concluded that most cultural evidence of land-use dated to after the end of the Civil War and primarily related to the late nineteenth century. No culturally significant sites were found, but it was recommended that monitoring should be carried out if future ground disturbing activities took place. excavated across the project. This was carried out by a representative of the Florida Park Service and the St Augustine Archaeologist. The results of the investigation are separately reported and is independent of the monitoring project. We were informed that the study failed to find any significant cultural resources, but a scatter of historic cultural materials and shell remains were recognized in the north and central sections (Personal communication; Carl D. Halbirt 2006). east that are associated with Tolomato River (Intracoastal Waterway) (Figure 1). It is situated on the Silver Bluff Terrace that constitutes the Atlantic coastal terrain. Prior to project selected tree removal, it was wooded, but cleared of underbrush. To the southeast is the headwater for Robinson Creek that meanders through the marshland to join the Tolomato River. The nearest relatively freshwater source would be the San Sebastian River about 731.0 m (2,400.0 ft) to the west. percent slopes. In the south end is Immokalee fine sand. Adjoining the east central and southern project boundaries is Pellicer silty clay loam, frequently flooded and it is associated with wetlands (Readle 1983:Sheet Number 25). Tavares fine sand is a moderately well drained soil that is nearly level with some gently sloping terrain (Readle 1983:18-20). The water table is found at depths between 101.6 to 203.2 cm (40.0 to 80.0 in). Vegetation includes longleaf pine, slash pine, laurel live oak, sand live oak, turkey oak and a scattering of saw palmetto. Pellicer silty clay loam, frequently flooded is associated with nearly level terrain that is situated in tidal marshes along stream estuaries (Readle 1983:29). Native vegetation consists of seashore saltgrass, bushy sea oxeye, glasswart and needlegrass rush. St. Johns County prehistory corresponds with that of Northeastern Florida (Table 1). The reduced sea level of the later Pleistocene Period resulted in placing Florida's coastal shoreline several miles to the east and near the eastern edge of the Continental Shelf. The interior river systems, such as the St. Johns, would have flowed more freely without the tidal effect found today. The earliest settlers, Paleoindian groups, would have established their migratory and food acquisition systems based on this earlier terrestrial configuration. Few sites have been recorded in this section of Florida. The only artifact attributable to St. Johns County was the recent recovery of a biface matching the Simpson biface in form (Madry et al. 2001:3; Carl Halbirt, personal communication,1994). These early nomadic hunters and gatherers were active in the Southeast and other sections of Florida. environment and in turn the melting of glacial ice reducing these sheets in a northerly direction. A mesic oak-hickory forest environment developed and sea levels rose (Milanich 1994). As the environment was altered, flora and fauna inventories and habitats underwent change. The earliest Native Americans underwent cultural changes as the environment altered and new practices emerged. These alterations saw modifications from the Pleistocene tool kit to that of the Early Archaic period configuration. Subsistence procurement practices changed and resulted in settlement practices that included both inland, riverine and coastal habitats. Their tool kits are recognized by the characteristic biface types which include the Kirk, Bollen, Santa Fe and Tallahassee (Madry et al. 2001:13). By around 5000 B.C. and for about the next 2,000 years, settlement practices maintained by these early hunters and gatherers were characterized by attributes which have been classified as the Middle Archaic period. It has been found that they apparently concentrated their settlements around inland Florida, but more recent research indicates that Atlantic coastal estuarine exploitation and habitation took place. Their presence is marked by recovery of biface types characteristic of the various cultural groups, e.g. Alachua, Hillsborough, Levy, Putnam biface types (Madry et al. 2001:13, Russo 1988, 1992; Bond 1992). northeastern section of Florida (ca. 3,000 2,000 B.C.). Food acquisition in this region of the Florida peninsula was focused along the St. Johns River and the coastal region of the Atlantic Ocean. The Late Archaic cultural groups maintained tools and settlement practices similar to those of their predecessors except for the introduction of a fabric tempered earthenware vessel. Around 2,000 B.C. this earthenware vessel, known as Orange pottery, was introduced into the domestic practices of the people. The vessels had both plain surface finishes and those that were decorated with incised lines. The use of the ceramic ware was found throughout Florida (Madry et al. 2001:13-14). The Orange and Transitional periods (2,000 500 B.C.) have an increase in sedentism in settlement practices and regional exploitation of riverine and coastal environments continued. Ceramic tempering practices saw the use of sand instead of fibers and the beginning of the St. Johns culture was at hand. 800) pottery remains found within St. Johns settlement deposits (Madry et al. 2001:14-17; Milanich 1994). The St. Johns II period (ca. A.D. 800 Spanish contact) was basically a continuation of the established cultural practices. Early on it is believed that interaction with the Mississippian cultural groups occurred. The period of time around A.D. 1050 appears to have been the peak of socio-political development with enlarged mounds, ceremonial complexes and the rise in the number of village and mound sites. It has been proposed that at this time a form of chiefdom organization was in use (Thunen and Ashley 1995). Subsistence practice information appears to reflect a continuation of behavior established before, but arriving French and Spanish explorers and settlers report Native American groups were maintaining a horticulture subsistence with beans, maize and squash being cultivated. Archaeological research has yet to substantiate an intensive program of cultigen use deposits (Madry et al. 2001:18). recognized. Savannah archaeological cultural presence appears to be associated with sand tempered ceramics with plain and cord-marked surface treatments. Recent interpretative studies believe these wares are of a local manufacture by Ocmulgee cultural groups relocating from central Georgia. These sites are basically centered in Duval and Nassau Counties (Madry et al. 2001:18). St. Johns chalky-tempered pottery is dominant in St. Johns County. (Hafford 2006). Research carried out at the Fort Mose II site reported earlier occupations dating from the Orange period and the St. Johns period (Deagan and MacMahon 1995). During the 2003 survey for the northern section of the project area, a low-density shell fragment scatter was encountered along with two fiber-tempered sherds affiliated with the Orange period (Halbirt 2003). Sites in the general region of the project have been identified on small marshy islands within the wetlands of the Intracoastal waterway. Coastal rising water levels have submerged the surrounding lower terrain and localizing the high ground. When Pedro Menendez de Aviles founded St. Augustine in 1565 under a patent from the royal house in Spain, it was his intention that the colony should be a full-scale enterprise with grants to members of the Menendez family and others connected with them in northern Spain (Lyon 1976). As it actually developed, the province took on a quite different character. In spite of the development of a chain of Catholic missions and some stock raising in the hinterland, St. Augustine became a garrison town where the main purpose was to protect the galleons loaded with riches as they headed back to Spain. The Gulf Stream reaches its northernmost point off northeast Florida, before it turns eastward across the Atlantic Ocean. This strategic position kept the town viable for the 198 years of Spain's first hegemony in Florida (Payne and Griffin 2003:9). Outsize grants were made during this period. Some were as large as 12.9 to 16.1 km (8.0 to 10.0 mi) in size. Rarely did these become working plantations, but instead amounted to overseas investments for well-placed men in Spain. Slaves fleeing their British owners in colonies to the north were given refuge by the Spanish and a Black fortified community, Fort Mose, was developed just to the north of St. Augustine (Figure 2) (Halbirt 2003:1). Places and is registered on the Florida Master Site File as 8SJ40. Florida was a pawn in the aftermath of the French and Indian War. In the treaty of Paris, Spain agreed to swap Florida (and several other possessions) for Havana, the important base in the West Indies lost to the British during the hostilities. Thus, Florida became the fourteenth British colony along the North Atlantic seaboard. Prior to the British arrival there was a great exodus of the Spanish population including the residents of Fort Mose. Spanish. First, Florida was divided into East Florida and West Florida. The plan was for both colonies to become thriving agricultural overseas possessions much as Virginia and the Carolinas already were. Parliament outlined a plan for up to 8,094 ha or 20,000 ac grants to be given to gentlemen in England who would then recruit white settlers to work them (Schafer 2001). On this side of the Atlantic, given the local conditions and the inclinations of the first two governors, things did not go according to plan. Smaller plantations were the order of the day in West Florida, and in East Florida, after several experiments with indentured white workers, most plantations recruited black slaves. These were brought from Africa, the northern British colonies, and the West Indies. The plantations were, in some cases, developed in accordance with the 4,047 8,094 ha or 10,000 20,000 ac plan. Nevertheless, many of the East Florida grantees never developed their plantations, and those who did, often hired managers instead of living on the plantations themselves (Payne and Griffin:11). Examining the 1769 map by William Gerald DeBrahm, there appears to be no land development around the immediate location of the project (Figure 3). A series of ownership listings are found west of the San Sebastian River (indicated on the map as a creek). Again by treaty, East Florida changed ownership. The action was in part associated with readjustments made after the American Revolution. This time the exchange pawn in the treaty was Gibraltar, a strategic British base guarding the Mediterranean. Florida was returned to Spain in 1783. In contrast with the First Spanish Period, Spain's intent was to populate the colony in order to establish a strong political presence, thus grants to populate the hinterland became the aim. The parcels were to be smaller in size than those of the British Period and they were issued based on a head rights equation. Following the lead taken by the British, East Florida was to be an agricultural colony. suitable plantation owners so the grant acquisition requirements were eased. By the last decade of the eighteenth century, development was beginning to take place as a result of these revised land grant requirements. Many settlers, who had been discouraged previously, were of a British background and situated in the West Indies. Land grants were made in the region, but not at the location of the project (Figure 4). Florida was finally added to the United States by treaty in 1821, and that land was opened up for settlement. Rural development and plantation growth continued. Sugar production was now the economic activity, because of favorable market demands (Payne and Griffin 2001:2). This economic situation was interrupted in 1835. The Second Seminole War, an attempt to vanquish the Seminole Indians and relocated them to the western territories of the United States, brought plantation activity to an abrupt halt in Florida. Within a matter of months, plantations south of St. Augustine were burned by the advancing Seminole raiding parties (Payne and Griffin 2001:15-17). Regional land development was taking place around St. Augustine, but this did not pertain to the project area (Figures 4, 5). Tallahassee. The time from then until the Civil War was a period when St. Augustine started to become a location of interest to visitors from other parts of the United States. In the hinterlands, small farms were situated around the landscape. Most of the larger agricultural endeavors were located within a few miles of the St. Johns River. As long as slavery continued, the work force involved was almost totally made up of African Americans (Graham 1978:55-83; Gannon 1976:216-226). At the time a Coastal Survey was completed and no development was noted in and around the project area (Figure 6). vicinity of the project property. At first the troops were Confederate as Florida was the second state to secede from the Union. Soon, however, St. Augustine was occupied by United States forces, and they used the roads to send detachments of soldiers to the St. Johns River. The river became a center of many minor skirmishes and some military action involving gunboats. later (Figures 9 and 10). When the adjustment is made to the stream channel, it places the railway and stream crossing farther to the south than depicted in the 1890 map. In turn the relocation aligns the rail corridor to cross the project area. By the 1890s, efforts were being made to develop other areas north of St. Augustine such as Sun City. It was located along the coastline to the east of the Tolomato River and the project area. Yachting facilities were used to make the trip from St. Augustine. An advertisement called the beach area a location where shells and sun beans can be picked up quite plentifully after a heavy gale (Bloomfield 1884:59). The bad economic times that shortly followed the First World War precluded much new settlement. The United States Bureau of Soils 1917 map illustrates the lack of the development around the project area and that of North Beach (Figure 8). During the Florida boom of the 1920s, a surge of interest in the rural sections led to an ambitious county road program. However, the burst of the bubble and the ensuing depression times of the 1930s and the subsequent upsets of World War II, caused a virtual stoppage of development. The 1943 United States Quadrangle Map for the general area illustrates the lack of growth in and around the project area during the early years of the war (Figure 9). It was after the war that most of the built up environment that we see around St. Augustine began to develop. No historic sites within the project area have been recorded with the Florida Master Site File. Nearby registered properties were residential and dated to the late 1920s and early1930s (Hafford 2006). The 1956, 1988, 1992 United States Quadrangle Map depicts three structures within or near the project area (Figure 10). One is located immediately to the east and remains unidentified. The next is situated in the west central part of the project and was an abandoned utility service building demolished during the project land clearing. The third was just to the west of the project area and represents a residential structure on the western side of Prado Avenue. nineteenth century Baya farmstead residence, a single family dwelling. The Baya residence is depicted to the south east of the present project boundary (Halbirt 2003:Figure 1). A unidentified structure is illustrated by the 1956, 1988, 1992 Quadrangle Map (Figure 10) and is shown in the 2003 survey (Halbirt 2003:1, 3,4, 5), but it was not identified by owner. disturbing activities associated with tree removal, excavation of three water-retention ponds, soil removal for the exhibit building foundation and trenching for water drainage pipe lines. Also, preparation of the utility trenches for electrical and sewer installation extending from museum building to the intersection of Prado Avenue and Isla Drive (Figure 11). Monitoring of the water pipe line installation immediately south of the power and sewer lines was not carried out, because of the redundancy created by observing the prior two utility excavations. The monitoring procedures were used to recognize buried cultural deposits and features. If any were found during the earthmoving procedure, a request would be made to stop the process. At that time an examination was made concerning the resource. A decision was made about the need for a more intensive investigation or to allow the excavation to continue. Artifacts encountered were retrieved, examined and packaged for study. When cultural material concentrations were found, only samples of the various diagnostic types were collected. Recoveries were also made in the immediate area of the earthmoving activities to expand upon the understanding being obtained by the excavation procedures. This information about cultural resource placement within the project area can be used to manage historic preservation measures during future construction procedures. locations where construction procedures were planned in the northern and central project sections (Figure 11). The removal was accomplished with an earthmoving machine pushing the tree trunk and limbs over onto the ground. This was followed by the excavation of the larger roots (Plate 2). The procedure was monitored at a safe distance and the resulting cavity was inspected to identify artifacts and cultural features. The surrounding disturbed ground surface was also investigated. After being removed the tree trunks and branches were cut into sizes sufficient for transport away from the project area. A scatter of oyster and clam shells was recognized in the southeastern part of the northern section and this had been previously reported by the earlier archaeological survey (Halbirt 2003). The tree removal cavities in the southeastern section contained a scatter of oyster and clam shell fragments, but upon examination during this procedure no artifacts were recognized. Investigation of the general northern area resulted in the recovery of eight architectural and domestic artifacts. Three were associated with household activities. These consisted of two white bodied earthenware body sherds; one with an oriental blue transfer print decoration and the other with a similar pattern of brown transfer print. Both types have manufacturing date ranges beginning at the end of the first quarter and extending as late as the termination of the nineteenth century (Doms n. d. and Joseph n. d.). The other ceramic artifact was from a table condiment container that had no bottom mark and its manufacturing date was unidentified. It was white glazed with a red band along the upper opening and a spout for pouring. On opposing sides were molded faces. One was of a male face with wide eyes and a beard curled upward at the edges of its mouth. The opposite face was possibly of an oriental representation. It depicted slanted eyes, full cheeks and a smiling mouth. Of the five architectural types, three brick crumbs were found that had striations on their surfaces and the matrices were not well formed and compacted in comparison with modern types. One was a clinker that exhibited distortion from over-firing in the kiln. An associated mortar chunk had some shell inclusions in a sandy matrix. A thin slate fragment may have been associated with building materials, such a roofing. A total of 24 artifacts were recovered as examples of the types revealed during the ground disturbing activities and most were classified as to their manufacturing dates. Nineteen of these were ceramic and many had production date ranges that included the last three quarters of the nineteenth century and may haie extended into the early twentieth century. Two white bodied earthenware sherds were transfer printed. Both had blue floral patterns and dated from ca. 1820 until as late as 1900 (Doms n. d.; Joseph, n. d.). Two other white bodied earthenware sherds had brown vine and green leaf decorative patterns on a rectangular impressed pattern. No production dates were established. Another body sherd had a light brown exterior glaze and may have been associated with the previous fragments. A white bodied earthenware body sherd had interior and exterior dark blue mottled glaze and was unclassified. An unidentified rim and body sherd of white bodied earthenware had a major portion of the decorative glaze eroded, but there were remnants of red exterior and white interior coloring. saucer sherds from a child's toy tea service were of white bodied earthenware and probably dated from ca. 1820 to 1900 (Doms n. d.; Joseph n. d.). Glassware consisted of a folded rim of white milk glass and a green glass body and base section of a probable wine bottle. Both artifacts were not dated as to manufacture. inclusions during firing. The manufacturing process appears to be not of a modem process. Two fragments of slate may have been used in roofing. without observing any cultural materials. Excavation encountered oyster and clam shell remains in the southeastern section of the foundation trench. A total of three water retention ponds were machine excavated with one located at the northern end of the project and the other two placed at the eastern and western sides of the central section (Figure 11; Plate 3). Excavation was accomplished by earthmoving machinery. The procedure was monitored and the back dirt pile was examined throughout the process. Maximum depth of excavation averaged 2.4 m (7.9 ft). The eastern pond did not contain artifacts while the other two did. A total of 19 artifacts were recovered as examples of the types revealed during the ground disturbing activities and most were classified as to the manufacturing date ranges (Doms n. d.; Joseph n. d.; South 1977:211). found, but John Maddock and Sons made ceramics from ca. 1890s until the turn of the century (Kovel and Kovel 1953). A fragment from a red bodied earthenware possible drawer pull was not identified by date and manufacturer. A green bottle base with "kick-up" and pontil break was unclassified by manufacturing date. A metal kerosene lamp burner was unable to be dated. Architectural materials consisted of a brick crumb with small cavities, possibly gas inclusions during firing. The manufacturing process appears to be not of a modem process. Twelve artifacts were retained as examples of the types revealed during the earthmoving procedures. Most ceramics were classified by their manufacturing dates. Two rim and body sherds had brown transfer printed floral decorative patterns that dated as early as 1825 and possibly continued in manufacture until 1900 (Doms n. d.; Joseph n. d.). Another sherd had a blue floral transfer printed design that was made from 1820 until possibly 1900 (Doms n. d.; Joseph n. d.). Three undecorated white bodied earthenware rim and body sherds were manufactured 1820 until 1900 (Doms n. d.; Joseph n. d.; South 1977:211). An undecorated porcelain body and base was not classified by date. Glassware consisted of a rim and neck from a brown glass bottle and it had a double rim shape. Brown glass became popular after the 1860s (Fike 1987:13). A fragment of green bottle glass was found, but unclassified by type and manufacture. An undated, five sided paneled, clear glass bottle fragment recovered was possibly used as a condiment container, but was unclassified by date of manufacture. Architectural artifacts consisted of a mortar fragment with shell inclusions. Faunal remains consisted of a single unclassified long bone fragment. retention ponds (Figure 11). The drainage was to remove excess water. This was directed to the marshlands that bordered the project on the east and in the south to the drainage for Saratoga Boulevard. Where the potential for impacting undisturbed soil strata was present, archaeological monitoring took place while the trench was being dug. Exceptions were the western line from the northern pond, central line between the eastern and western ponds and the one in the southern end. Both were in fill and roadway disturbed soils and did not offer adverse impact to natural strata. Excavation depth for the eastern trench was 1.6 m (5.2 ft) and there were no introduced soil deposits. The double drainage at the northern part of the central section was excavated to a depth of 1.4 m (4.6 ft) below surface. The upper soil was introduced fill and only about 30.0 cm (11.8 in) of original soil was present. project section. The recovery was made during the earlier archaeological study in the northern area and included the north part of the project area (Halbirt 2003). Care was taken preparatory to the excavation of the eastern drainage line, because of the potential for encountering prehistoric deposits. northern section of the wetlands (Figure 11; Plate 4). Preparatory to the pipeline excavation, vegetation within the alignment and immediately adjoining it was removed by earthmoving machinery. A surface examination of the disturbed area produced a cluster of brick crumbs. Just to the south and west, a finished and engraved limestone fragment was identified by a worker. Another recognized an historic sherd just to the east of the alignment's southern end. It was decided to undertake limited test excavations in this area of the pipe line. Test units (50.0 cm [19.9 in] in diameter) were positioned and dug to a depth of 80.0 cm (31.5 in). Test Unit 1 and Test Unit 2 were placed in a judgmental staggered alignment near the southern end of the pipeline and later two more were placed at the location of the engraved limestone fragment (Test Unit 3) and the brick scatter (Test Unit 4). The surface historic ceramic sherd found by the worker was 2.0 m (6.6 ft) north and 3.0 m (9.8 ft) to the east of the pipe line's southern boundary. It was a buff bodied earthenware tea pot body and pouring spout fragment with Bennington glaze (ca. 1830-1900) (Joseph n. d.) and also defined as American Rockingham glaze ware (ca. 1912-1900) (Brown 1982:3). Test Unit 1 was located along the eastern side of the excavation alignment and 3.0 m (9.8 ft) north of the southern terminus (Figure 12). A brown chert secondary flake was found at 30.0 to 50.0 cm (11.9 to 19.9 in) below ground surface in brown sand subsoil. There was no indication of a shell midden. Test Unit 2 was dug 3.0 m (9.8 ft) to the north of Test unit 1 and 2.0 m (6.6 ft) to the west (Figure 12). No artifacts were recognized. Test Unit 3 was positioned at the location of the engraved limestone fragment, i.e. 9.0 m (29.5 ft) north of the southern pipe terminus and 2.0 m (6.6 ft) to the west of the alignment's eastern side (Figure 12). The fragment had finished surfaces and an inscription (Plate 5). Lettering with "ORN/16 L" appears on the surface. A possible shield outline with a disturbed interior adjoins the lettering. The reverse side of the fragment has an edge indention to fit within the top of container. Excavation of Test Unit 3 found a midden of compacted oyster and clam shells at a depth of 27 .0 to 60.0 cm (10.6 to 23.6 in) below ground surface. Near the base of the deposit, a single grit tempered ceramic sherd was recovered. Test Unit 4 was situated in a location (11.0 m [36.1 ft]) north of the southern terminus along the eastern side of the excavation alignment (Figure 12). The ground surface had been disturbed to a depth of between 5.0 to 10.0 cm (2.0 to in 3.9 in) during the brush removal process prior to the pipeline excavation. The activity had exposed a scatter of stiff mud brick crumbs and fragments of lime mortar chunks with gravel inclusions. A sample collection of these was made. recognized, except a base and body sherd from a white bodied earthenware mug. This was found 25.0 m (82.0 ft) north of the pipeline's southern terminus. The general manufacturing date was 1820 to 1900 (Doms n. d.; Joseph, n. d.; South 1977:211). The location had introduced fill of 1.1 m [3.6 ft] in thickness and this reduced the strata of natural soils to approximately 30.0 cm (11.8 in) (Figure 11). Monitoring did not recognize any architectural or domestic cultural feature or materials. where Prado Avenue and Isla Drive intersected, to the museum building (Figure 11). The utility lines closely paralleled one another eastward along the northeastern entrance road, then they separated and proceeded across the future parking and landscaped area where they entered the museum building. The lines paralleled one another and were separated at a distance of 1.0 m (3.3 ft) or less while they proceeded along the earthen entrance road. The electric line was the most northern. From that point they parted with the electric line going to the northeast and terminating at the north end of the building's western side (Plate 6). The remaining utilities (sewer and water) continued to the east and passed the building's southwestern corner and then turned to the north and entered through the southern side. Prior to the utility excavation initiation, a general surface survey was made along the southern side of the earthen entrance road at its western end. This led to the recognition of a scatter of historic artifacts. The area was situated on the southern side of the road and immediately to the east of a drainage ditch located along the eastern side of Prado Avenue. The cluster measured 20.0 m (65.6 ft) east-west and 10.0 m (32.8 ft) north-south. The ground surface had been disturbed by brush clearing to a depth of about 10.0 cm (3.9 in). A collection was made to secure a representative sample representing functional types. 1.5 m (4.9 ft) below ground surface. 1.0 m (3.3 ft) south of the sewer alignment. Of the 29 artifacts recovered, storage and table service items numbered 17. There were 16 ceramic sherds and one was a beverage bottle fragment. Medicinal items consisted of six container fragments. Architecture remains were six brick fragments and a chunk of mortar. One bone fragment was recovered. Table service ceramics contained three white bodied earthenware rim and body sherds with blue floral transfer print patterns (ca. 1820-1865 and possibly untill900) (Doms n. d.; Joseph n. d.). Another sherd had a brown floral pattern (ca. 1825 until as late as 1900) (Doms n. d.; Joseph n. d.). Seven white bodied earthenware rim, body and base sherds were plain and without a decorative pattern (1820-1920) (Doms n. d.; Joseph, n. d.; South 1977:211). A body and base sherd had a bottom mark with a winged horse over a shield in the corner and robed standing figure on right "...CO." at base. One white bodied rim sherd of ironstone had a manufacturing date range from 1840 until 1900 (Doms n. d.) or 1813 to the present (Joseph n. d.). Two porcelain body and rim sherds had blue floral decorative patterns. The sherds were not classifiable as to the date of manufacture. Three glass containers were probably associated with medicine. One clear glass bottle fragment had a flat rim, straight neck and expanded shoulders (Fike 1987:8, 16). The next was an oval body and flat base section of a natural glass. The body was inscribed "...BLUE". The bottle form was popular for Jamaica Ginger, an alcohol extract of ginger. This was popular in the last half of the nineteenth century (Fike 1987:8, 16). The third was a rectangular body with indented panel and flat base section of a clear glass bottle. The base had "DOCTOR HOOD'S/ EUREKA LIVER MEDICINE/COLUMBUS, GA." The bottle was not classifiable by manufacturing date, but was probably used in the last half of the nineteenth century (Fike 1987:16). during the last half of the nineteenth century (Fike 1987:10, 16). Another natural glass bottle fragment had a "blake form" base and was recessed. A wine or brandy upper neck section of clear glass had a slightly expanding neck and rounded shoulders and probably dates from ca. 1860 to 1920 (Fike 1987:8, 15). Architectural artifacts consisted of a brick crumb with length-wise striations that were probably created by the smoothing process in the clay molding. These are associated with premodem brick manufacturing (Payne and Thomas 1993). A second crumb had irregular form and was probably early, as well. Two crumbs were not classified, because of their small sizes. A chunk of sand mortar was recovered. Faunal remains consisted of a single, unclassified long bone fragment that had been butchered at one end. Excavation began at the eastern end of the trench (Plate 6). A glass bottle fragment and brick were recovered at a distance of 4.0 to 5.0 m (13.1 to 16.4 ft) to the west of the museum building. They were recognized at a depth of 30.0 to 40.0 cm (11.8 to 15.7 in ) below ground surface. The bottle was of clear glass with a bead rim, enlarged straight neck and ring near its lower section. The shoulders were outward sloping and the bottle had straight sides with a slightly indented base. It was not classified as to manufacturing date range. The brick had a yellow body, possibly a furnace type, i.e. heat resistant. One end was constricted to a point and would have been associated with a specialized construction purpose associated with excessive heat (Payne and Thomas 1993). An iron utility pipe was encountered by excavation and avoided. It was located 42.7 m (140.0 ft) west of the pipe line's juncture with the museum building. It was 73.6 cm (29.0 in) in outside diameter and recognized at a depth of 70.0 cm (27.6 in) below ground surface. The pipe line had been abandoned. The next area that had buried artifacts was located between 30.0 to 43.0 m (98.4 to 101.1 ft) east of the western terminus along the earthen access road. The depth of artifacts recovered ranged from 35.0 to 90.0 cm (13.8 to 35.4 in). pattern of parallel slashes and would have the same date range given for the other plain forms. Two body and base sherds mended and were of an ironstone body with plain surfaces. There was a raised annular base with an unidentified body mark "WARRENTED.. .SUPER/ IRON" in the center with two adjoining shields. To the left were stars and stripes and on the right was an undefined crest. Ironstone research produced two manufacturing date ranges (ca. 18401900) (Doms n. d.) or 1813 to the present day (Joseph n. d.). shoulders expanded to a round and straight sided body. The base was slightly indented and had raised lettering "CHESEBROUGH MFG CoNASELINE." Underneath was a "3". A date of manufacture was not identified. The other bottle fragment was a wine bottle rim and neck of green glass. The form was associated with champagne, but was undated (Jones and Sullivan 1985:79). bricks had curving striations across the broad surfaces. This was characteristic of blade cutting patterns associated with the stiff mud manufacturing process (Payne and Thomas 1993). They predate the modem methods and are generally associated with the second half of the nineteenth century. Both had poorly consolidated matrices. One had three evenly spaced square holes on the broad surfaces. Another brick had length wise striations that would have originated from mold smoothing. The matrix had numerous small holes that may have resulted from gases exiting during the kiln burning. All of the bricks appeared to date to the later part of the nineteenth century; certainly before modem processes became popular. A fragment of terra cotta drain pipe was found. Excavation was started at the western end of the pipe line and artifacts were recovered from the surface removal to a depth of around 1.5 m (4.9 ft). A cluster of six ceramic artifacts was unearthed between 8.0 to 10.0 m (26.4 to 32.8 ft) east of the western project boundary. Their recovery depths were not observed other than between 0 to 1.5 m (4.9 ft). A rim and four body sherds along with a container top were recovered and they were white bodied earthenware without decoration (1820-1900) (Doms n. d.; Joseph n. d.; South 1977:211). substantial concentration of buried historic domestic and architectural artifacts (Plate 7). The location corresponded with that of the cultural material recovery made along the electric line trench immediately to the north (ca. 1.0 m [3.3 ft]). A sample of these was made with selection based on diagnostic functional types. Ceramic vessel fragments included white bodied earthenware, ironstone, and porcelain. Undecorated white bodied earthenware included three rim, body and annular base sherds from table service plates. Two other rim and body sherds were from fluid food service vessels with open spouts. A rim and body sherd was associated with a beverage mug. These white bodied earthenware ceramics had manufacturing dates from 1820 to 1900 (Doms n. d.; Joseph n. d.; South 1977:211). Fourteen glass bottles and fragments were recovered. Two bottles would have contained infant's food. They had bodies with "MELLIN'S/INFANT'S FOOD/DOLIBER-GOODALE Co/BOSTON". Their product dated to 1898+ (Fike 1987:8, 10, 57). Their natural glass form had an English ring rim with constricted lower sections, expanded neck, rounded shoulders, straight sided round bodies and slightly indented bases. Another glass bottle was for a beverage and manufactured from ca. 1825 and later. Lettering was on both sides. The front had the raised text "ESTD/1825/J G Co LTD/ ORIGINAL/MAKERS OF GINGER ALE". The obverse side had the raised lettering "GRATTAN/& CO LD/BELFAST/IRELAND". An empty rectangle outline separated company and city identifying lettering. On the base was a "G". The inscription places the product at the beginning of the second quarter of the nineteenth century and production probably continued from that time. It was made of natural glass and had a ring rim with straight neck, everted shoulders, straight sided and rounded body with slightly rounded base (Fike 1987:8, 10). A natural glass bottle had a flat rim and straight neck, everted shoulders, windsor oval (indented rectangular) body and flat base. The body form generally was for medical use. The front side had "FOR CONSUMPTION". Side panel had "HAZELTINE & CO". Opposite side had PISO'S CURE". The base inscription was "27". The product was used for the treatment of pulmonary tuberculosis and introduced in 1864. It was manufactured in Warren, Pennsylvania by Hazeltine and Company. The name was changed in 1904 (Fike 1987:8, 10, 16. 104). raised oval on the front, but no lettering was present. The obverse was labeled "THIS BOTTLE/ NOT TO/BE SOLD". The base had a "2". It had a blob rim and short straight neck, expanding shoulders, straight rounded body with a round and slightly indented base. Its form was that of a Hutchinson shape that was generally used for soda water. The bottle contained the remains of a "Patent Spring Stopper" that was introduced in 1879 and discontinued in use around 1912. No product maker could be found (Fike 1987:8, 10, 16, 17). JACKSONVILLE/FLA". Obverse side had "THIS BOTTLE/NOT TO/BE SOLD". The product was not identified. The bottle was of natural glass with the rim and neck missing. Shoulders were everted with body straight sided and round. Base was flat and slightly indented (Fike 1987:8, 10). A brown glass bottle had a blob rim, straight neck, everted shoulders, straight sides in an oval shape and a flat base with an indention.. The front side of the body was inscribed "WARNER'S/SAFE/KIDNEY & LIVER/CURE/(Picture)/ROCHESTER, NY". The picture was a line drawing of a safe on casters with two combination tumblers. Base indention had "A7". The firm was active using this name from ca. 1893 until 1900 (Fike 1987:8, 10, 107). Another brown glass bottle had a flat rim, straight neck, everted shoulders, straight side and ovate body with a flat base. The base was inscribed "THE TROMMER/EXT. MALT CO./FREMONT, O, U.S.A." The firm was started in 1877 and produced a treatment for digestive disorders, cough, bronchitis, asthma and consumption (Fike 1987:8, 10, 79). A green glass bottle body section had straight sides and an indented base. Lettering on the base was "SAXLEHNERS/HUNYADI/JANOS/BITTERQUELLE". This was a "Natural Aperient Water" used for its gentle laxative properties. It was first made around 1863 and was exported from London (Fike 1987:41). A clear glass bottle had a bead rim, straight neck, rounded shoulders, a straight sided round body and a base with a slight indention. The body had "CHESEBROUGH MFG Co/ VASELINE". The product was started in 1880 (Fike 1987:86). Another clear glass bottle had a bead rim that contained a clear glass stopper. The bottle had a straight neck, everted shoulders, straight sided and rounded body with flat base. No identifying labeling was present, but the container shape was associated with medicine storage, possibly pills. No manufacturing date range was found. (Fike 1987:8, 15). The last clear glass bottle had a flat rim, straight neck, everted shoulders, straight sided round body and indented flat base. Bottle form was generally associated with prescription use, but the particular shape could have held chemical or household products. No product labeling was present and no manufacturing date range identified (Fike 1987: 8, 10, 14). The remaining bottles were associated with beverages. One was a green glass wine/ champagne bottle. It had a flattened string rim champagne flat top, tapered neck, rounded shoulders, straight sided round body, rounded base with push up form (Jones and Sullivan 1985:87, 90, 96, 99, 101, 110, 113). The other bottle was brown glass and had a wine/ champagne form with a V-shaped rim, tapered neck, rounded shoulders, straight sided round body, rounded base with a push up form (Jones and Sullivan 1985:96, 99, 101, 110, 113). No manufacturing dates were found for the bottles. A base and body fragment from a kerosene clear glass lamp shade was recovered, but no manufacturing identification was found. A bonded brick feature was visible at ground surface in the sewer trench alignment at 48.0 m (157.5 ft) east of the western terminus. It was rectangular in form and the interior was open and filled with earth. The feature was probably related to an earlier buried iron utility pipe line encountered by the electric line excavation. Monitoring noted an area of oyster shell remains during the ground disturbance activities at the eastern water retention pond in the project's middle section. The scatter exited the project area to the east and continued along an elevated trail through the northern part of wetlands (Figure 13; Plate 8). The linear earthen feature had sloping sides with an elevated, level midsection that averaged 4.0 m (13.1 ft) in width. It proceeded in a northeasterly direction and terminated in the wetlands with an oval 67.1 m (220.0 ft) east of the project boundary. The oval was concrete and had a sawed off wooden pole base in the center (Plate 9). A short distance (11.6 m [38.0 ft]) to the northeast there was another linear formation of the same form and it continued in the somewhat general direction joining the eastern section of the fast land immediately east of the northeastern project boundary. flake, as well. The pottery type was made by the Guale Native Americans in Northeastern Florida. The cultural group post dates St. Johns II and would have been in this area during the early Spanish occupation beginning in the late sixteenth century (Mandry Smith and Whitehill 2001:20). Because of the paucity of prehistoric artifacts, including the two Orange period sherds found earlier about 42.7 m (140.0 ft) to the northeast (Halbirt 2003), these recoveries are considered to be isolated occurrences and not a site, per se. When more intensive investigations take place, the classification may be changed to a prehistoric site and the cultural resource boundaries and significance can be ascertained. Historic artifact types were mainly affiliated with architectural, domestic and hygienic purposes and had dates that ranged from the second quarter to the end of the nineteenth century. These were identified at depths ranging from 10.0 cm (3.9 in) below ground surface to depths reaching 1.6 m (5.2 ft). clearing, tree removal activities in the northern section. These occurred in the central part of the section extending southward from the northern pond (Figure 11). In the northern part of the central area, i.e. immediately south of the northern entrance road, numerous historic artifacts were recognized. They were principally domestic types exposed by shallow ground disturbance (0-20.0 cm [0-7.9 in]) from tree removal and vehicular traffic over the ground surface. Recoveries were also made during the digging of the northern pond (ground surface to 2.4 m [7.9 ft]). These were mainly domestic in nature. A similar scatter was revealed during the excavation of the northern end of the western pond in the project's central section (Figure 11). These latter artifacts may have represented a continuation of the scatter found in the northern part of the central section. No cultural materials were recognized in the eastern pond, except oyster shells. These have been mentioned in the discussion of the earthen linear alignment across the northern section of the marshland along the project's eastern boundary. Another similar artifact scatter was recognized immediately south of the western terminus of the northern entrance road (Figure 11). A localized concentration of artifacts was exposed by surface ground disturbance (0-20.0 cm [0-7.9 in]). The scatter was of a substantial density and generally consisted of domestic types. Excavation of the electric and sewer pipe line trenches, short distances to the east, encountered another array of domestic and medicinal artifacts that were found at depths ranging from 10.0 cm (3.9 in) to 1.6 (5.2 ft). A study of the artifact types recovered from the overall collection, indicated they were associated with architectural and domestic functional purposes. It must be remembered that the collection was judgmental in nature and was made with an effort to secure a sample of the various types present. The building materials consisted of bricks and sand mortar. Bricks had matrices that did not appear to be of a modem manufacturing type, i.e. they were not well formed and fired. Also, several had curved surface striations that have been attributed to stiff mud manufacturing methods and the technology was common in the last half of the nineteenth century (Payne and Thomas 1993). Several other bricks had three square perforations evenly spaced across their stretcher (length-wise) sides. These were not dated, but were probably pre-modem because of their not well compressed matrices. Modem brick manufacturing began in the twentieth century (Payne and Thomas 1993). The mortar was not dated as to manufacturing attributes. Domestic cultural materials were mainly food service and storage related artifact types and those for medical purposes. Table service wares were almost exclusively of a white bodied earthenware type. Transfer print patterns were not numerous and only consisted of 12 sherds with either blue, brown or green glazes depicting recognizable decorative patterns. Their manufacturing dates range from as early as 1820 and continuing until 1900 (Doms n. d.; Joseph n.d.; South 1977:211). The most common ceramic form was undecorated and had the same general date range. The other table service ware was ironstone and was manufactured from as early as 1813 to the present (Doms n. d.; Joseph n. d.). Porcelain was recorded, but it was of a limited representation and manufacturing dates were not established, except for one sherd. The bottom manufacturer's labeling included the name "John Maddoc," but the particular bottom design was not identified. John Maddock and Sons produced ceramics from ca. 1890s to the early 1900s (Kovel and Kovel 1953). Table service types included serving dishes, condiment containers and beverage service pitchers. No table flatware or beverage service glasses were recognized. The glass containers were associated with beverages and illness remedies. Bottle remains for alcoholic beverages such as champagne, brandy and wine were recovered, but not dateable with one exception found along the northern entrance road. This was a brandy or wine clear glass bottle with a form that indicated a manufacturing date of ca. 1860 to 1920 (Fike 1987: 8, 15). However, medicine packaging information narrowed the date range for the artifact scatters associated with the northern entrance road. Nine bottles had manufacturing dates beginning around 1860. The latest termination date for the eight bottles was recognized as 1912. Another bottle had a Hutchinson form with a Patent Spring Stopper that was made from 1879 to 1912 (Fike 1987:8, 10, 16, 17). Medicinal contents were for the treatment of such illnesses as asthma, bronchitis, consumption, coughs, digestive disorders, gentle laxative, kidney and liver disorders. Other bottles with related contents were infant food, ginger ale and vaseline. Origin and deposition history of the historic remains has not been definitely determined; but Ms. Frances Chamberlain (personal communication 2006) has resided near the project area for over eight decades and believes the historic artifact remains are principally related to the City of St. Augustine's refuse disposal around the end of the nineteenth century. Also, Charles A. Tingley of the St. Augustine Historical Society (personal communication 2006) believes that disposal activity did occur in the area around that time. The ceramic artifact date range suggested a use and deposition in the last three quarters of the nineteenth century. The medical bottle designations pointed to the last four decades of that time. It was for this reason that the refuse site has been recorded, reported and assigned the Master Site File designation 8SJ5238, Fort Mose Historic Artifact Scatter. The site seems to be from the second half of the nineteenth century until the beginning of the twentieth century. The principal portion of the site (8SJ5238) appears to be located in the north central area. It extends from the north entrance road's junction with Prado Avenue and goes eastward to the western edge of the wetland foliage (Figure 14; Plate 7). Then it turns south and goes to the northern end of the western pond. A limited recovery of historic artifacts from around the northern pond and those from the earlier investigations (Halbirt 2003) are not included in the site at this time. All of these areas should be examined in defining the site's boundaries in the future. An inscribed limestone fragment that was found in disturbed surface context may be from a small sarcophagus cover. It was found at the southern end of the eastern drainage pipe line after the topsoil had been disturbed by the removal of vegetation (Figure 12; Plates 4, 5). The inscribed limestone fragment, possibly part of a sarcophagus lid, will require additional examination to confirm its purpose. This feature connected with the central section of the project area, but was beyond the eastern boundary (Figures 11, 13). 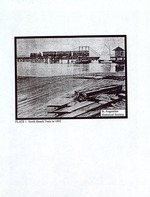 It may be related to a late nineteenth century railway alignment that went from St. Augustine to the North Beach development in the last decades of the nineteenth century (Plate 1). The line was incorrectly depicted in 1890 map, because of the north meander positioning (Figure 7). The stream's channel was corrected in the1943 map (Figure 9). This placed the railroad alignment at the project area (Figure 15). It appeared to correspond with the linear earthen feature that crosses the northern section of the marshland adjoining the east central boundary (Figure 13; Plate 8). The alignment leaves the marsh in a northeasterly direction just to the east of the project boundary. The circular form and concrete support feature with a truncated pole in the center may or may not be a more recent addition to the raised earthen alignment after the abandonment of the rail line (Plate 9). The specific nature of these manmade linear earthen features was not clearly evident, but it was possibly associated with an elevated passageway through the marshland, probably the nineteenth century North Beach rail line. (Figures 7, 9, 11, 13, 15). Continued historic research concerning the nineteenth century railroad alignment is needed. Also, archaeological examination of the rail line's bedding in the marsh and the adjoining ground surface to northeast of the project area is necessary. These field investigations will establish the feature's form and possibly recover artifacts related to its purpose. The linear earthen feature has been designated as site 8SJ5257. Archaeological monitoring took place during ground disturbance construction activities in preparation for the museum exhibit building of the Fort Mose State Park. This included surface investigations, earthmoving monitoring and the excavation of four test units. As a result cultural resources were found, both prehistoric and historic in nature. Prehistoric artifacts were recovered in the northeastern part of the project, a chert secondary flake and grit tempered sherd, probably of the San Marcos type. The flake was a short distance from a shell midden where the sherd was found. Both are classified as isolated occurrences. Historic artifacts were recovered that had manufacturing dates ranging from the second half of the nineteenth century to the twentieth century. They were identified during the tree removal, pond excavation and pipeline excavation activities. Artifacts were architectural and domestic in function. The former consisted of non-modern brick types and mortar chunks. The latter mainly consisted containers and food service items. These included food storage and table service, including beverage bottles. Medicine containers constituted the other container type. It is possible that a portion, if not the majority, of these materials was deposited as a trash deposition activity by St. Augustine. The refuse disposal area has been classified as a site (8SJ5238). A small finished limestone lid fragment, an isolated occurrence, found in the northeastern part of the project area may be related to a human interment in the area. A elevated linear earthen feature was recognized just to the east of the project's central area boundary and it crossed the adjoining marsh in a northeasterly direction. It is possible that the earthen bedding was associated with the railroad that went from St. Augustine to North Beach in the latter part of the nineteenth century. It was designated as 8SJ5257. The line would probably have crossed the project's central and southern sections and also passed just to the south and east of the northern section. Based on an understanding of the present construction plans, there will be no more earth disturbance activities that could endanger cultural resources. Sites recognized during current construction activities have been examined and recorded. Cultural material samples have been obtained to provide a preliminary understanding of their temporal and functional natures. It is understood that the possible railroad bedding alignment that crosses the wetland to the east and south of the project is not to be disturbed. Based on this information, it is felt that project related cultural resources are protected at this time. If for some reason, earthmoving construction activities do continue and cultural resources or human remains (Chapter 872.05, Florida Statues) are recognized, the disturbance is to be halted and DNS Contracting representatives or those responsible are required to notify the Office of the State Historic Preservation Officer. Then, DNS Contracting is to follow the procedures specified. This action is in accordance with historic preservation and human remains management requirements maintained by the State of Florida. The research records and artifacts associated with the project are the property of the State of Florida and are to be submitted for curation at the completion of the investigations and approval of the project report. Three future cultural resource management activities are recommended. First, the historic refuse concentration (8SJ5238), the locations of the prehistoric flake and sherd (isolate occurrences) and the finished limestone lid fragment (isolated occurrence) recognized by this project need to be provided with preservation management protection. This requires that more intensive historic background and field investigations should be conducted. Research will clarify the functional, spatial and temporal natures of the cultural resources permitting preservation measures to be finalized. The research will supply a more comprehensive understanding of the cultural resources along with their cultural significance evaluation. Second, the park's boundaries include the elevated linear earthen feature in the eastern wetlands, i.e. the possible rail line (8SJ5257). The site needs a background study and field investigations to confirm its nature and possible relationship with the North Beach Railway. At the time its cultural significance can be assessed. Finally, although a previous cultural resource survey (Halbirt 2003) was conducted in the north project section, it did not examine the adjoining wooded terrain bordering the marshland. The remainder of the park property has not been investigated to recognize and provide protection for any cultural resources present. This needs to be accomplished. 1884 Bloomfield's llustrated Historical Guide Embracing an Account of the Antiquities ofSt. Historical Society, Florida. Bond, Stanley C., Jr.
1992 Archaeological Excavations at 8SJ42, the Crescent Beach Site, St. Johns County, Florida. Florida Anthropologist 45:148-161. Brown, Ann R.
Highways, Location and Environmental Studies Office, Dover, Delaware. Deagan, Kathleen and Darcie MacMahon 1995 Fort Mose Colonial America's Black Fortress of Freedom. University Press of Florida, Gainesville. n.d. "Historic Artifact Laboratory Notes." University of Delaware, Center for Archaeological Research, Newark, Delaware. Fike, Richard E.
1987 The Bottle Book: A Comprehensive Guide to Historic, Embossed Medicine Bottles. 1978 The Awaking of St. Augustine: The Anderson Family and the Oldest City, 1821 1924. St.
2006 Recorded site assessment by the Florida Master Site File, Division of Historical Resources, Tallahassee, Florida. Halbirt, Carl D.
Annual Conference on South Carolina Archaeology, Columbia. 2003 A Phase IArchaeological Survey at 33 Prado Avenue: Evaluating Cultural Resources at New Fort Mose. Prepared for the Planning and Building Department, City of St.
Augustine by the City Archaeologist. 1990 "Gracia Real de Santa Teresa de Mose: A Free Black Town in Spanish Colonial Florida." 1976 The Enterprise ofFlorida: Pedro Menendez de Aviles and the Spanish Conquest of 15651568. The University Press of Florida, Gainesville. Madry, Scott, Greg C. Smith, Carrie Whitehill, Kenneth Kvamme, Rusty Newman, Brent Handley, Gregory Hendryx and Sidney Johnston 2001 Archaeological Survey and Development of the GIS-Based Site Probability Model St.
Johns County, Florida. Environmental Sciences Incorporated, Jacksonville, Florida. Milanich, Jerald T.
1994 The Archaeology ofPrecolumbian Florida. University of Florida Press, Gainesville. Miller, James J. 1998 An Environmental History of Northeast Florida. University Press of Florida, Gainesville. Payne, Ted M. and Patricia C. Griffin, Ph.D. 2001 Sugar Making in East Florida and the History of Eight Plantations. Prepared for The Volusia Anthropological Society, Inc. By American Preservation Consultants, Inc. St.
MAAR Associates, Inc. Newark, Delaware. Readle, Elmer L.
1983 Soil Survey ofSt. Johns County, Florida. United States Department of Agriculture, Soil Conservation Service. 1988 Coastal Adaptions in Eastern Florida: Models and Methods. Archaeology of Eastern North America 16:159-176. 1977 Method and Theory in Historical Archaeology. Academic Press, New York. Institution of Washington, Publication 511, 1941 Washington, D. C.
3 William Gerard DeBrahm's Map of East Florida, 1769. On file at the St.
Institution of Washington, Publication 511, 1941, Washington, D.C.
6 U. S. Coastal Survey Office, 1862. On file at the St. Augustine Historical Society. 7 North Beach Company, 1890. On file at the St. Augustine Historical Society. 8 U. S. Department of Agriculture, Bureau of Soils Map, 1917. On file at the St.
9 St. Augustine Quadrangle Map, 1943. U. S. Geological Survey, 7.5 minute series. On file at the St. Augustine Historical Society. minute series. On file at the St. Augustine Historical Society. 2006 Personal Communication, Library Manager, St. Augustine Historical Society. 1969 1979 ABC Sports, Inc. Manager of Program Control and Facilities. Twenty-six years of experience as a professional archaeologist has entailed directing investigations concerning prehistoric and historic cultures. These have mainly been situated along the eastern coast of North America and in the United States Virgin Islands. For the past decade, research has centered in Florida and the Virgin Islands. Investigations over the 23 years have principally dealt with cultural resource management compliance actions and have included preservation planning, Phase I surveys through Phase Ill mitigative activities and public interpretation. Projects have mainlypertained to archaeology, but in many cases there has been interaction with architectural research. Emphasis has been placed on anthropological interpretations of the archaeological record where data has permitted. Interest has been to go beyond quantifying and classifying artifacts into spatial patterns to the recognition of their behavioral purposes. 2005 Reconnaissance Archaeological Survey for a Project at 2119 State Road 16, St.
Over 150 cultural resource professional projects have been completed for governmental and private sector clients. Personal responsibilities have included agency compliance, administrative management, client relations, project research and preparation of the final report using state-of-the-art computerization. These contracts have mainly been concerned with regulatory procedures and guidelines ranging from Federal to state and county levels. This included requirements of the U.S. Air Force, U.S. Army and the Army Corps of Engineers. Compliance procedures have varied substantially due to the numerous agencies involved, but they have centered upon the Secretary of Interiors' standards and guidelines. Florida experience has included interaction with the Division of Historical Resources, Division of Recreation and Parks and various counties. Field expertise includes survey goals and strategies, reconnaissance and excavation procedures, mapping, photography, record keeping, transit operation, personnel management and administrative procedures for all levels of research. Only recently has the use of the G.P.S. been undertaken. Data analysis has entailed intensive studies of prehistoric and historic artifacts along with interaction with consulting experts for faunal, floral and radiocarbon studies. Report preparation experience consists of writing, illustration and production in compliance with various guidelines. A comprehensive understanding of image scanning and graphic art preparation has been obtained for color and black and white. 1958 Notre Dame High School, Moylan, PA.
St. Croix, V.I. Landmark Society Florida Anthropological Society St. Augustine Archaeological Society St. Augustine Historical Society. 1992-pres. President & Co-owner, American Preservation Consultants, Inc.
(APC) St. Augustine, Florida. 1985-92 Field Archaeologist/Laboratory Technician, MAAR Associates, Inc. (MAI) Joppa, Maryland and Newark, Delaware. 1981-83 Field Archaeologist/Laboratory Technician, Cultural Heritage Research Services, Inc (CHRS). Ormond Beach, Volusia County, Florida. Springs, Florida, (Florida Division of Recreation and Parks). Construction Project Area on State Road 16 Between First and Second Streets, St. Residential Project, Vilano Beach, St. Johns County, Florida. Development Project, St. Johns County, Florida. Tomoka River at Route 1, Ormond Beach, Florida. 2001 Editor, APC, Sugar Making in East Florida and the History of Eight Plantations. Faver-Dykes State Park, St. Johns County, Florida. Tomoka State Park, Volusia County Florida. Spanish Period Plantation, Volusia County, Florida. 1996 Laboratory Technician/Editor, APC, Cultural resource Survey at Smith Bay Plantation, St. Thomas, USVI. Cultural Resource Survey, St. Thomas, USVI. North Carolina Route 13 Bypass Cultural resource Survey. Street Shaft Feature, City of Wilmington, Delaware. at Feature 12, Texas, Maryland, Baltimore County. Exploratory Well, Texaco, Inc., Charles County, Maryland. Hans Lollik Island, St. Thomas. and Compost Facility, Cape May County, New Jersey. Island Phase IB Survey, St. Thomas, USVI. Boulevard Phase I Survey, Baltimore County, Maryland. 1990 Field Archaeologist, MAI, SPWA Pipeline Phase I Survey, Greene County Pennsylvania. Apartments Phase I Survey, Anne Arundel County, Maryland. 1989 Laboratory Technician/Editor, MAI, Robin Bay Prehistoric Site Phase II Investigation, St. Croix, USVI. 1989-1991 Field Archaeologist/Laboratory Technician, MAI, Data Recovery at the Poe-Bums 19th century residence, Texas, Maryland. 1989 Field Archaeologist./Laboratory Technician, MAI, Perryman Park Phase I Survey, Harford County, Maryland. 1988 Field Archaeologist, MAI, Cane Bay Prehistoric Site Data Recovery, St. Croix, USVI. 1988 Field Archaeologist, MAI, UPS Building, Harrington Cemetery Relocation, Kent County, Delaware. 1987 Field Archaeologist/Laboratory Technician, MAI, Rte. 77 over Double Pipe Creek Phase II Survey (18FR592), Carroll and Frederick Counties, Maryland. 1986 Field Archaeologist, MAI, Burlington County Landfill, Phase II Investigations. New Jersey. Archaeological Survey (31BF115 & 31BF 117), North Carolina. 1982 Laboratory Technician, CHRS, Federal Reserve Bank Historic Exhibit, Baltimore, Maryland, Artifact Restoration and Reconstruction. 1981 Field Archaeologist/Laboratory Technician, CHRS, Phase II Investigations at 18HO62 and 18HO063. 1989-93 Research Associate with Ted Payne for Robin Bay Prehistoric Site, St. Croix, USVI continued analysis. 1990-91 Research Associate with Ted Payne for Virgin Island prehistoric site collection analysis at Florida Museum of Natural History, Smithsonian Museum and Yale University Peabody Museum. Field School, East Orange Water Reserve. 2 Northern end of central 1 White bodied earthenware body and base sherd, connecting road, general blue floral exterior transfer printed patten ca. annular rim, white glaze (ca. 1820-1900) (Doms n.
substantially raised annular rim, white glaze (ca. body sherd, white glaze (ca. 1840-1900) (Doms n.
surface engraved with damaged shield on left and lettering on right, shield base is pointed with interior inscription eroded or disturbed, upper line of lettering has "...orn" and lower line "1" with possible "6" and "L" at outer edge. Purpose is not evident, but it was possibly a fragment of a container cover. :If "orn" is from the word born, the cover may be associated with a human interment sarcophagus for a young person such as an infant. pipe line, 26.0 m north of sherd ca. 1820-1900 (Doms n. d.; Joseph n.
indented panel, rectangular body flat base "blake form" and indented circular depression with "76"
1 Brick with yellow body, one end pointed, an exterior "octagons" form, possibly a furnace type (Payne and Thomas 1993). Green glass wine/champagne bottle, flattened string rim champagne flat top, tapered neck, rounded shoulders, straight round body, rounded base with push up. (no manufacturing date range) (Jones and Sullivan 1985:87, 90, 96, 99, 101, 110, 113). Consult Guide to the Survey Log Sheet for detailed instructions. Fi-ew: 0-20%), S(-ome: 20-50%); M(-ost: 50-90%); or A(-ll, Nearly all: 90-100%). If needed write others at bottom. F(-ew: 0-20%), S(-ome: 20-50%); M(-ost: 50-90%); or A(ll, Nearly all: 90-100%). If needed write others at bottom. 0 Check here if NO historicallatchitectural methods were used. Site Form Used: 0 SmartForm X FMSF Paper Form O Approved Custom Form: Attach copies of written approval from FMSF Supervisor.